PRIA over the past two years has been working collectively with the urban poor community in the Slums of Raipur and facilitated the organisation of Slum Improvement Committees (SIC) as a representative body of the slum dwellers for their own community. These SICs are a tool of empowerment for the community and play a vital role as an interface between the demand side (community) and the supply side (State and Centre). Two slums that PRIA has been successful in formulating SIC are the non-tenable slums adjacent to the Railway line: Indrabhata & Chandrashekhar Nagar. 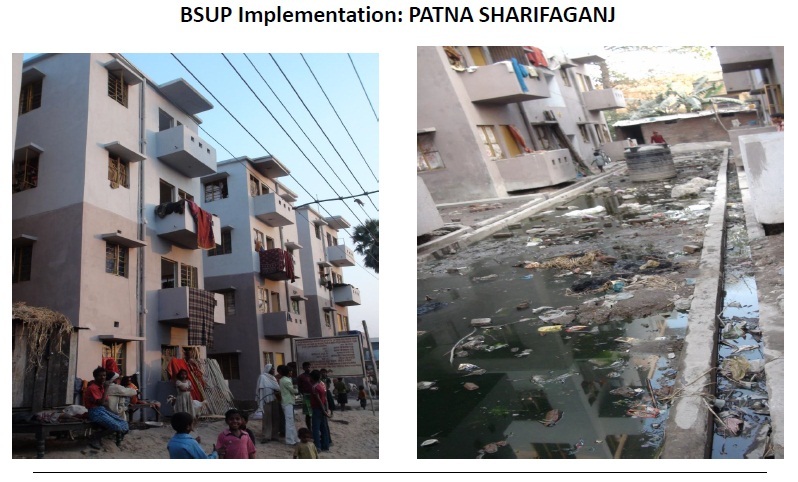 SIC members of these two slums have been successful in demanding their rights by asking for a sustainable rehabilitation abode under Rajiv Awas Yojana from the city officials. 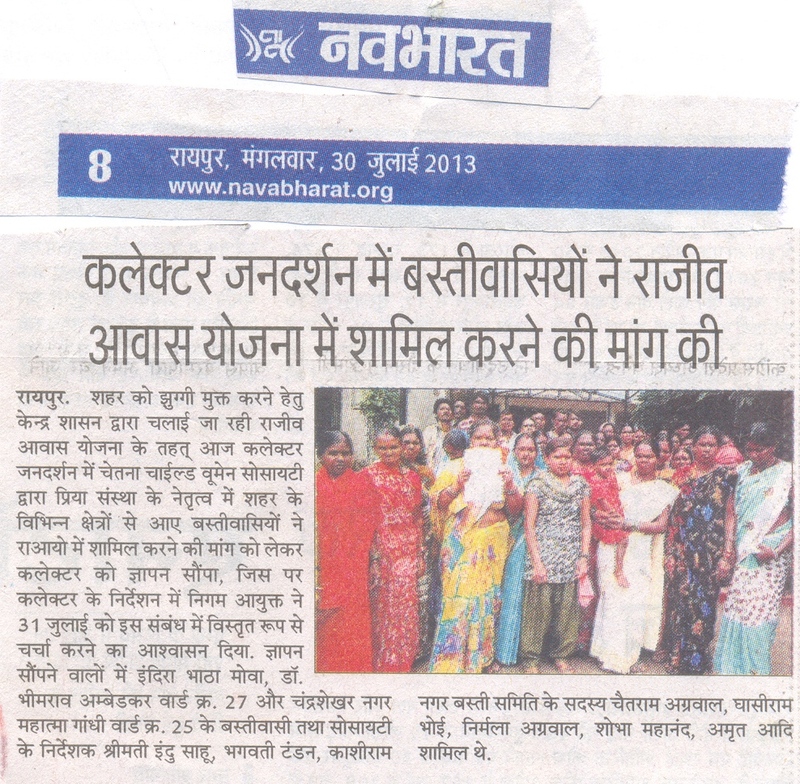 Regular interaction with the Collector and Commissioner of Raipur Municipal Corporation has resulted in an assurance from the Commissioner of dwelling units at Saddu under the Basic Services of Urban Poor (BSUP) scheme of JNNURM and regular meetings with the community for their participation. In ‘An Uncertain Glory: India and its Contradictions’ by Jean Dreze, Amartya Sen, two of India’s leading economists argue that despite strong economic development, there must be a greater understanding of inequalities in the country, especially in the lack of attention to the essential needs of the poor. Sen and Drèze’s argument is that these huge social investments have proved critical to sustaining China’s impressive economic growth. Without comparable foundations, India’s much lauded economic growth is faltering. Furthermore, they argue that India’s overriding preoccupation with economic growth makes no sense without recognising that human development depends on how that wealth is used and distributed. What’s the purpose of a development model that produces luxury shopping malls rather than sanitation systems that ensure millions of healthy lives, ask Drèze and Sen, accusing India of “unaimed opulence”. India is caught in the absurd paradox of people having mobile phones but no toilets. What makes this comparison so powerful is that Bangladesh has targeted the position of women not just through government policy but also through the work of non-governmental organisations such as BRACand the Grameen Bank. As a result, there have been astonishing successes, says Sen, such as a dramatic fall in fertility rate and girls now outnumbering boys in education. All this has been achieved despite having half the per capita income of India. Other impoverished neighbours such as Nepal have made great strides, while even Sri Lanka has kept well ahead of India on key indicators despite a bitter civil war for much of the last 30 years. Drèze and Sen conclude in their book that India has “some of the worst human development indicators in the world” and features in the bottom 15 countries, along with Afghanistan, Yemen and Pakistan. Seven of the poorest Indian states account for the biggest concentration of deprivation on the globe. Mobile phones are being used to reduce India’s high infant mortality rate. A new initiative, the Mobile Alliance for Maternal Action (MAMA), gives expecting and new mothers access to vital and often life-saving information using mobile phones. Subscribers receive weekly health messages and reminders through text messages or voice; the audio option is essential given that 35 percent of women in India are illiterate. The messages include everything from proper nutrition, breastfeeding, vaccinations and referrals to local health resources. The service also incorporates “insights and delightful details alongside health messages, sending mothers week by week messages that tell her how her baby is growing.” Through these adaptable messages, MAMA has reached over 20 million mothers. In Rio de Janeiro, Brazil, an initiative called Wikimapa aims to enable young people from Rio’s low-income areas to map interesting sites and relevant activities in their neighborhoods. The maps can be accessed via a web browser or using a mobile application that incorporates GPS to allow for detailed mapping. The project’s goal is to promote greater knowledge and understanding of the culture and history of Rio’s poorest neighborhoods. It also cultivates a positive sense of identity among favela residents, who might not know the historical details of their community’s past, nor what resources, events and activities are available to them. One out of every two people in the world who sends money over a mobile phone is Kenyan, and 70 percent of Kenyans have an M-PESA account. M-PESA is a mobile phone money transfer system that allows users to easily deposit, transfer and withdraw money at any M-PESA kiosk through the use of SMS technology. Not only is M-PESA the most successful money-moving service in the world, it has also morphed into the main banking system for the urban poor, who lack access to mainstream banks. By making cash mobile, this technology can be used for paying bills, groceries, school fees and rent, and for sending money home (which is especially important for Kenyans). In addition, running an M-PESA agency is an excellent entrepreneurial opportunity; some agents now earn a higher monthly income than lawyers or doctors. Finally, the M-PESA system has succeeded in limiting muggings and robberies in Nairobi, because few people walk around with large amounts of money in their pocket when they can have it in their phone instead. Mobile banking has contributed to financial inclusion for the most marginalized populations in Mexico City as well. One bank, Grupo Financiero Banorte, has implemented mobile banking through phone applications and through SMS in order to attract customers who lack access to formal banking channels. However, challenges remain due to limited device support for the application and the high cost of text messages. Accion International, in partnership with Compartamos Banco, the largest micro-finance bank in Latin America, has developed a technology platform based on mobile devices to provide low-income populations with access to banking services, remittances and savings. As these four examples show, mobile technology can be a development tool for reducing marginalization, improving health indicators, and creating a sense of community. Join URB.im, the global community for just and inclusive cities, to read more on this topic and to join the conversation. Slum redevelopment and rehabilitation projects are often in a state of deadlock: any significant change requires more resources and land. However, availing of more resources and land requires significant change on the ground. Reflecting the magnitude of the challenge, several ambitious slum redevelopment projects have either been ineffective or have become notorious non-starters. For example in Dhaka, a study conducted in 2011 found that the Bhasantek Rehabilitation Project, started in 1998, had failed to provide shelter to evicted slum-dwellers. In India, plans to redevelop Dharavi have been discussed since 1997 with little progress. Public opinion of slum redevelopment projects argues for and against redevelopment. The middle- and upper-classes, especially those living close to a slum community, are gratified by the expected improvement to their surroundings. However, the urban poor are by-and-large suspicious of such initiatives, predicting them to be inequitable. This is largely due to the manner in which redevelopment projects have been handled in the past. Historically, the urban poor have not been included in plans for redevelopment, nor in efforts to relocate them. When provided, temporary facilities are woefully inadequate, and the living and working needs of the urban poor are rarely incorporated into the design of new buildings. Promises of project deadlines and available facilities at redeveloped sites are rarely kept. While real estate developers seem to gain from redevelopment efforts, the urban poor realize little value for themselves, resulting in a historic distrust of developers and redevelopment efforts. Local enterprises in particular have been hard hit, due to both a need for increased investments, as well as the opportunity cost of having to move locations twice over. In spite of poor historic performance and perceptions, there are new models emerging that indicate a change in how developers approach redevelopment projects, and these efforts finally seem to address the critical issue of building trust within urban poor communities. Currently, there seems to be two models of slum and cluster redevelopment that work. One is promoted by private developers such as Omkar. They offer temporary residential facilities that are as convenient as can be made possible. These private developers design the redevelopment project for dual purposes: to build low-income, high-rise housing and commercial space for slum-dwellers, and to build luxury apartment complexes or commercial space. The sale of luxury apartments or commercial space then more than covers the costs of redevelopment projects. The second model is coordinated by not-for-profit entities, such as trusts, along with private partners like design firms. In this model, the government provides funding while not-for-profit entities are involved in community mobilization and facilitate development of the master redevelopment plan. This model typically has no for-sale luxury component, and the redeveloped area often remains entirely with the erstwhile slum residents. A critical component for the success of these two different models is community mobilization and engagement; model success depends on including the community, recognizing their needs and addressing them effectively. This has been recognized and included in the “Delhi Declaration,” after the International Conference on Inclusive Urban Planning in New Delhi on February 18-19, 2013. While non-governmental organizations (NGOs) have traditionally been able to work with the community based on their longstanding goodwill and familiarity with residents, private companies are now adopting a similar approach with intense community engagement over a shorter time period. Private players are able to increase their efficacy by enabling their field people to make small, on-the-spot investment and design decisions that will help solve relatively simple problems as they crop up. Irrespective of which model of redevelopment is adopted, the greatest challenge is building trust within urban poor communities where education is low and most transactions informal. Convincing such communities of the value of written agreements and contracts, and helping them understand design, financial projections and other aspects of the project can be very time- and resource-intensive with no guarantee of results. Aside from private and not-for-profit players, the critical stakeholder group that holds the keys to the success of any redevelopment project are local businesses, resident employers of informal workers and home-based workers, many of whom are women. Most slum communities are hubs of informal entrepreneurial activity. These enterprises are vital not only for the micro economy of a slum, but also to the wider macro economy of a city and its country. Since these enterprises provide livelihoods to the local urban poor, it is understandable that any redevelopment proposal is met with serious reservations regarding the cost of temporary dwellings, re-establishment, loss of customers and maintenance costs of the new buildings. Given the impact local enterprises have on the urban poor, any redevelopment proposal is likely to affect enterprise owners and employees. Not only would productivity and revenues suffer in the short-term during the transition period, but also, the enterprises will incur costs in moving their machinery and equipment. This uncertainty of enterprise tenure would prevail until construction is completed on the redevelopment project and possession handed back over to slum-dwellers, whereupon local entrepreneurs have to undertake the exercise of moving back to their original place of business. For enterprises that are directly interacting with customers, this could translate into a significant financial loss since they are unlikely to spend additional time or money looking for shops in another location. Another important concern is the time needed for redevelopment and the probability of a project being completed on time. In the event of project delays, the financial losses to these slum enterprises may mount on account of extended leases at temporary locations, and a costly change in plans and schedules. For most local entrepreneurs in slum communities, the long-term concern is the location of the shop post-redevelopment, the amount of space available and the suitability of that space for their enterprise. In most redevelopment plans, proposals are dominated by new multi-story buildings, as opposed to single-story homes, in order to make space for roads and other infrastructural amenities. As a result, many existing enterprises would need to find a new way of conducting business; the benefits that came from proximity and visibility to the streets may be lost, thereby making the possibility of losing existing and new customers a serious challenge. Enterprises may be offered a choice between a smaller space on the ground floor of a redeveloped building or a larger space on a higher floor. The suitability of the solution depends on the nature of the business. For example, retailers would prefer to have their shops on the ground floor and close to a street, even if it means a smaller shop area. On the other hand, service providers may be more amenable to the idea of a higher floor with larger area. Another significant concern of urban poor entrepreneurs and enterprises is the suitability of the planned buildings and infrastructure for their business. Enterprises that work with oversized raw material, such as timber and wrought iron, often need to transport and store them in close proximity to their workplace. Even relatively lightweight raw materials such as rags and scraps come in voluminous bulk packaging. The standardized design of the redeveloped tenements may offer less opportunity for such business-driven space customization. Businesses such as tanning shops and potters, amongst others, are likely to need customized infrastructure that has to be incorporated in the master redevelopment plan. Lastly, but arguably most important, is the fact that the cost of maintaining residence and work in a redeveloped building is an aspect that gets little attention in the planning process. While the durability of makeshift homes in slums may be inferior, seasonal maintenance requirements, such as fortification during the rainy season, can be easily and inexpensively met. However, high-rise buildings would constantly require resources — electricity to run elevator banks or to pump water to rooftop tanks for general building use. In addition, these buildings require expensive diesel power backup to reliably maintain essential services during times of power outages. There is little data available to compare the direct and indirect maintenance costs of living in informal slum dwellings versus brick-and-mortar buildings built as redeveloped housing. However, anecdotal evidence suggests that the urban poor often vacate the redeveloped property that they receive and resume living in a different slum community due to the new, higher maintenance costs, as well as the profit potential of renting or selling a newly redeveloped residence to complement other income generation efforts. Bhendi Bazaar is a settlement in south Mumbai that is over 100 years old, and while it is not a slum, there are some unique aspects to its redevelopment that are worth understanding as lessons for slum rehabilitation. Age, a dense population and lack of infrastructure upgradation has left the area with narrow and squalid dead-end alleyways, crumbling buildings that are dangerous and unfit for human habitation, and limited water and sanitation facilities — not unlike many slum communities. The majority of the buildings in the area are chawls, or lower-middle class housing with shared verandas and bathrooms, and often rented out to several families. The Bhendi Bazaar Redevelopment Project (BBRP) received environmental clearance in March 2013. It is currently the first major cluster redevelopment project in Mumbai and is being overseen by the charitable Saifee Burhani Upliftment Trust (SBUT). The Trust has engaged several reputable private firms and consultants to work on this project. The plan covers 16.5 acres of land, a notably small area compared to Dharavi’s sprawl of over 500 acres, for instance. The project affects more than 20,000 people, compared to Dharavi’s over 600,000. The plan includes about 270 buildings with 3,200 residential houses between 100 to 300 square feet each, and over 1,200 businesses. Since residents chose a high-street shopping design for the redeveloped locality while participating in the master plan development exercise, most existing enterprises will continue to face the street even after redevelopment. The design has incentivized enterprises to move to higher floors if they so choose by providing larger shop areas. While customizing construction for specific enterprises is still a challenge, it is overcome by appropriately allocating area on the higher floors when possible. The Trust is using smart design to ensure that the redevelopment is green, easy to maintain, and stays cool. The proposed towers are organized by height to allow the cooling sea breezes to reach residents. The project has been designed to consume less electricity than market standards, and by recycling and sewage treatment, it discharges less sewage. This addresses concerns around the availability of water and electricity, and also reduces the need for air-conditioning, as well as the overall maintenance costs of the buildings. Interestingly, the project makes no distinction between the residences that would be allocated to current residents and those that are earmarked for sale. This has ensured that existing residents are treated on-par with new buyers. However, this has only been possible due to the unique not-for-profit nature of the project. “The project is run under the aegis of His Holiness Dr. Syedna Mohammed Burhanuddin Saheb, and profits, if any, are earmarked for community and neighborhood development initiatives. This has greatly enhanced the trust of locals in the project,” Abbas explains. He also points out the primary difference between the Bhendi Bazaar project and other slum redevelopment projects is education. “The residents of Bhendi Bazaar are engaged in various businesses and are educated. Our Project is under the Urban Renewal Scheme as against the scheme for Slum Redevelopment under which the Dharavi Redevelopment Project is. In comparison to Dharavi, the size of our Project is smaller and more manageable,” he says. This, along with tenure security, are aspects that will need to be addressed in all upcoming slum redevelopment projects. It is the people – the urban poor – not the buildings, that are at the center of slum redevelopment. Many of these people are entrepreneurs or self-employed, and are looking for means to protect and expand their livelihoods. Due to the long drawn-out process and uncertainty of outcomes, redevelopment projects on large expanses of slum-dwelling land are viewed with suspicion. Entrepreneurs and their enterprises in slums are a critical stakeholder group for redevelopment. While tenure is a long-recognized challenge that needs to be addressed for slum-dwellers, education seems to be another significant area for intervention. However, both of these are long-term interventions and progress is slow. As a starting point, however, building trust with urban poor communities by carefully identifying their concerns and addressing them can mean progress. The BBRP example reiterates that projects and services for any community, including the urban poor, cannot afford to be poorly conceived, designed and implemented. There is, in fact, a pressing need to make slum redevelopment projects greener, cleaner and less polluting than before. This would make resources such as electricity and water less of a concern and add to the chances of the urban poor actually living in them by making the maintenance costs less burdensome. If more such initiatives could be undertaken, there would be greater precedent of whether collaboration between the community, and private and not-for-profit stakeholders provides the “perfect” equation for equitable redevelopment for the urban poor and the city. Re-think urban poverty, participatory municipal governance and role of civil society – highlights of National Urban Poverty Consultation! 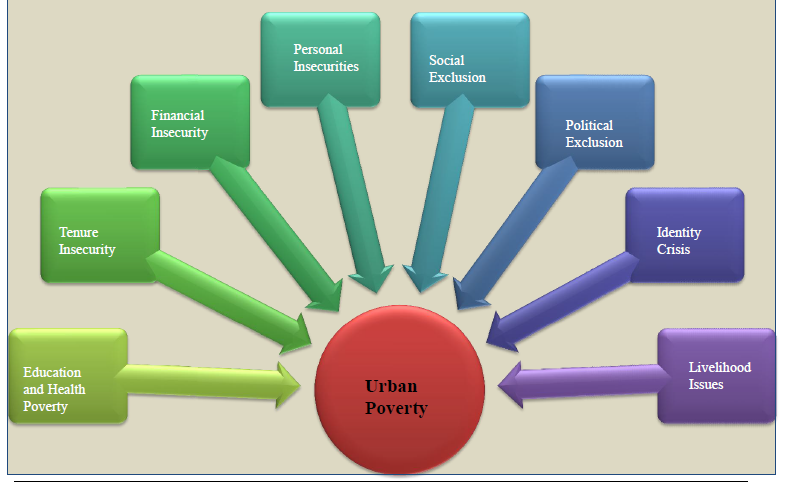 PRIA, with its action research and experiences in various states in India on urban poverty theorised various dimensions of urban poverty in India and the role civil society should/can play in dealing with the issues of urban poverty in our country. PRIA also sighted the issues faced by the community due to poor or inefficient delivery of services by the state and the centre and spoke about the challenges faced by the marginalised women and children groups amongst the poor. Dr. Renu Khosla of Centre for Urban and Regional Excellence pointed out how ‘Halving Poverty’ by 2030,aim highlighted by UN, is a Big Challenge! She highlighted the ‘three groups of urban poor’. Core poor individuals or households are those with income levels half the official poverty line and need to be specially attentive to this group. Intermediate poor are those that have per capita monthly incomes between Rs. 270 and the poverty line and require inter-mediation, both financial and institutional. Transitional poor are clustered just above the poverty line but remain at the risk of slipping below the poverty line. The main challenge is to work on the issues of ‘core poor’ who are often synonyms with ‘informal, irregular work, lack identity, are illegal citizen and acquire illegal land, they deal with insecurity and are the invisible lot in the city in respect to planning and services’.Interestingly Dr. Khosla elaborated on how there is a need to‘re or unthink the definition of poverty’. Poverty that has been as a problem of scarcity is now about identification, targeting and distribution. 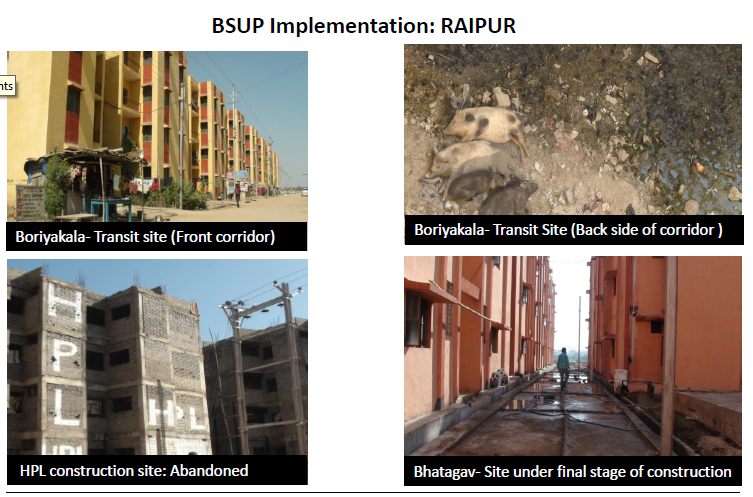 SPARC also illustrated from their research and critical review of BSUP Projects of Raipur, Chhattisgarh, and the inadequate state of housing for the poor implemented by the city municipality. It for certain raises questions on the role of municipal bodies in addressing urban poverty and their capacity and what should be the mechanism that the municipal bodies be more transparent and accountable in providing for urban poor. Prof. Mukesh Kanaskar, Director of All India Institute of Self Government, deliberated on the importance and urgency of ‘participatory municipal governance’ in our country. The clear question that confront our cities is the fact that even though many schemes for urban poverty may be proposed at the central level, but how well are they translated at state and city level is the question. The fact that programmes like Rajiv Awas Yojana may have articulated participatory methods, but do they really see the light of the day at city level! It is obvious that there is a need for facilitative mechanism at local level with greater stress on capacity building & IEC at multiple levels, especially at municipal governance.He sighted some of the work his institution has done, in respect to this capacity building and facilitation process. A portable IEC kit was developed for Support to National Policy for Urban Poverty Reduction for Rajiv Awas Yojana. Another participatory tool developed by the institute is the Self-Assessment and Planning for Management and Maintenance of Tenements under RAY by community representatives. R. Padmini from CIVIC Bangalore explained about the present situation of municipal governance and how it addresses the urban poverty issues on ground. He elaborated on the delivery service mechanism as existing at present and the potential role that ‘ward committees’ can play for more participatory governance. He also highlighted some other positive examples of community participation such as Kudumshree in Kerala and Single- Window system of Delhi. Manoj Rai, of PRIA summarised various aspects, issues and challenges that were elaborated upon by all the experts and from the work of PRIA, SPARC and various partners that are working closely on urban poverty issues across the country. From on-ground work it is clear that the pressing issues are ‘multiple dimensionality of urban poor in our country and there is an urgent need to redefine and recognise the urban poor’, ‘the fact that there is a very weak structure or municipal governance at present in respect to dealing with urban poverty issues and there is need of effective devolution of powers along with appropriate capacity building at municipal level’ and ‘ the need for proper implementation of various urban poor schemes and services with adequate translation from centre to state to local level’. 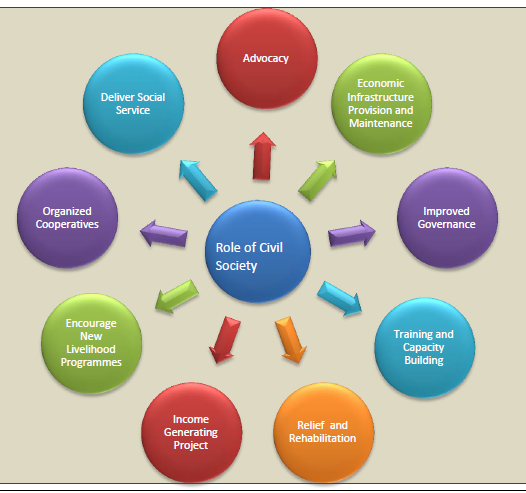 He pressed upon the Role of Civil Society in this demand-service equation, wherein through initiatives of PRIA, SPARC and others there is now a movement to collectivise, engage and mobilise community. It is this ray of hope that these organisations belief will be the key in addressing urban poverty issues in our country. Prof. Randy David’s recent column in the Philippine Daily Inquirer discusses why the poor move to cities. It is spot-on in its analysis of urban migration. In a nutshell, they are drawn by opportunity. People come to cities to earn more, to get an education, and to better their lives. Cities, especially big cities, provide more opportunities per square kilometer than rural areas do. Prof. David correctly points to the failure of our long history of “balik-probinsya” programs, which give the urban poor incentives to move back to the countryside. The poor, finding no opportunities in the provinces, eventually return to the cities. He prescribes “a willful long-term program to develop the countryside” to address rural poverty. He calls for better land reform, more schools and hospitals in rural areas, and technical and financial support for rural enterprises. I agree with him that we need to invest in agricultural productivity and in better rural schools and hospitals. On the other hand, I disagree that rural investment will, as he implies, reduce the migration to cities. It is a common mistake to think that if the poor go to the cities for opportunity, then maybe we can prevent them from migrating to the cities by bringing opportunity to them. However, this doesn’t square with reality, as the experience of Japan and South Korea shows. Better farm support will create better farms; it will not stem the migration to cities. Japan and South Korea had successful and well-funded rural investment programs and successful land reform programs. Their governments broke up land oligarchies, built great rural infrastructure, and provided excellent support to small farms. The farmers in these leading global economies are protected and productive; they earn a profit. And yet, despite rural prosperity, urbanization still exploded in these two countries. More than 90 percent of Japan’s population is urban; 83 percent of South Koreans live in cities. Furthermore, Greater Tokyo is one of the top five economies in the world. It has a population of 35 million, and it is the largest megacity in the world. Seoul, on the other hand, has the world’s fourth-highest GDP (behind Tokyo, New York City, and Los Angeles). Eleven million people call it home. It can be argued that the success of their cities allowed Japan and Korea to fund their rural prosperity programs. A symbiotic relationship exists between the urban and the rural, between the farm and the city. Urban growth improves rural incomes because the city is the market for farm products. This is why I differ with Prof. David on his prescription. If we want to cure rural poverty, we need to invest in urban opportunities. William Cobbett, manager of Cities Alliance, has a poster in his office that says “More Urban Growth, Less Rural Poverty.” It is a counter-intuitive statement, but historical evidence has proven it to be true. So, what do we do? Understand, please, that I am not saying that we should not invest in the countryside; we definitely need to do so. The bottom line is, we need to invest in the countryside and we must also invest in our cities, especially our big cities. Research by physicists and mathematicians shows that bigger cities are more efficient and create more innovation and opportunities, while needing less infrastructure. McKinsey ran scenarios of urban and economic growth in China that showed that the growth of a few big cities was a better investment than trying to spread the investment and growth in many smaller cities. As we invest in our cities, we need to get them right. We must make sure that they are inclusive and that they expand opportunities. Cobbett shows us the way with this statement: “The key to getting our cities right is to transform policies that, at the moment, are dominated by the practice of social exclusion and anti-poor policies.” This means that we need to create cities that are walkable and have good public transit, cities that provide affordable housing and good schools and parks. As I’ve said before, we need to change how we think about Metro Manila and the rest of our cities. The urban population in the Philippines is growing, and it will continue to do so. This is a good thing. We need to make sure our cities can provide opportunities for everyone. We need to create cities that are efficient engines for moving people out of poverty. Benjamin de la Peña is the Associate Director for Urban Development at the Rockefeller Foundation. The views and opinions expressed in this article do not necessarily reflect those of the Foundation. Participatory Research in Asia (PRIA) is an international centre for learning and promotion of participation and democratic governance.